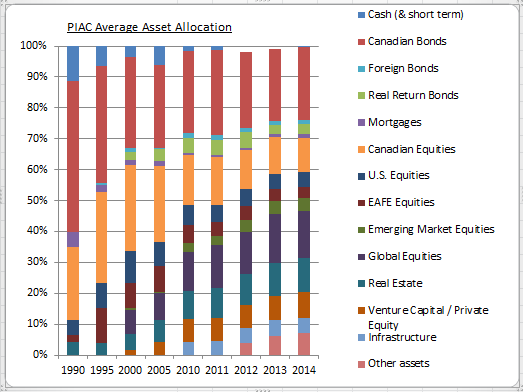 The PIAC Canadian pension plan composite average asset allocation for 2014 changed very little from previous years. 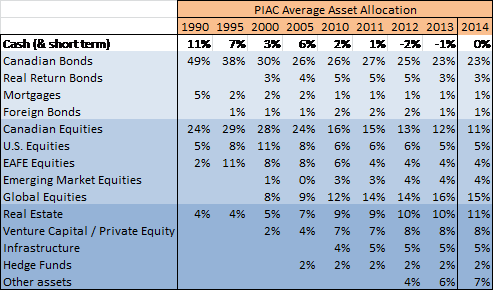 Read the commentary here PIAC composite asset allocation commentary. A couple of questions; how do global equities differ from emerging markets and EAFE. Also what is the best way for a retail investor to access real estate and infrastructure. I assume private equity and hedge funds are not appropriate for different reasons. I always enjoy your posts. ‘Global’ can mean Developed Markets (DM) (US, Canada, EAFE but not Emerging Markets (EM)). Or Global can mean All Countries which includes the developed markets AND EM. MSCI World (developed markets only) versus MSCI All Country World index (ACWI) (which includes developed markets AND emerging markets) are good reference points. I am partial to splitting World from EM because I believe there is some divergence in movement between the two thus offering different opportunity at different times. (My delusion is that I can time across geographies). For simplicity, most choose either Global (MSCI World) or ACWI (MSCI ACWI which includes EM). A more risk averse investor might choose World (DM only) rather than ACWI (which includes EM). Standard and Poors (S&P) indexes will be slightly different from MSCI indexes but same idea. ETF’s will mimic one or the other. (Again, on the delusion theme, I have separate ETF’s for EAFE, US and Canada). The Canadian market for real estate and REIT ETF’s is tiny. REIT ETF’s offer little difference in exposure(s). The two I use are VRE and XRE. No, but XAL can provide a portfolio with different risk factors.